← Oatmeal – Not Just for Breakfast Anymore? I thought I’d start off with a DIY recipe. You heard all about the cocoa massage melts in a previous post. I can’t get them to look prettier and they resemble cracked jagged rocks. Meh. I really like how my skin felt after testing it, though, so I want to share the recipe for those with the inclination to make them. You’ll need some molds for this, but you can even use ice trays. I found that silicone molds worked best for me, because these buggers don’t want to budge after the set. If you have a bite size brownie sheet mold it filled all 24 holes in mine, plus three other small molds. Put all of the ingredients in a double boiler and melt over a medium low heat. Whisk it frequently. The mixture will look frothy for a while; just use a spoon to check that the wax is fully melted. Once the mixture is fully incorporated and smooth work fast to pour the mixture into the designated molds. This will clump fast! Worst case situation you can pop it in the microwave in a safe container for a few seconds and it’ll buy you a few minutes. The massage square melts with the heat from your skin. 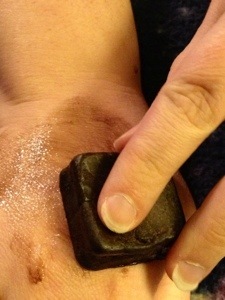 It will look brown on the skin at first, but as it soaks in, or you spread it to other skin, the brown disappears. If the squares will not set up and you find that the inside is still wet when you test one, then you can put them in the freezer for a few minutes. The only down side to freezing is that they will not look overly appealing because of the temperature differences. If they are setting well, let them sit and settle for a few days. That freezer is the last resort. Anyway, if you have any questions, let me know! All you do is let a square warm in your hand and rub it in anywhere (except overly sensitive areas). It works so much better if someone else massages it in for you, too. *sassy wink* I hope a few of you enjoy the recipe. If you have any questions, don’t hesitate to ask me and I’ll try to help. Have fun!! They massage in really well. If your body heat isn’t melting it as desired, just hit it for a few moments with the blow dryer. Posted in Bath Products (non-soap) and tagged handmade, Homemade, spa. Bookmark the permalink.